This is a big week for a lot of people – players and their entourages; administators; referees; the town of Carnoustie; restaurants; hotels; guest houses; media. The list goes on and on. It could, of course, be life changing for someone – a first time major winner, for example. 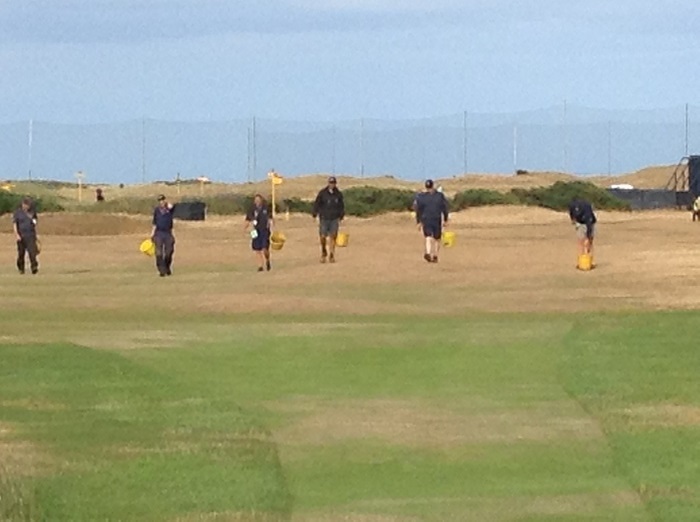 One man pivotal to the success of the entire week, however, is Craig Boath, head greenkeeper at the Carnoustie Links. This is his third Open at the Angus course. In 1999, that year of the unplayable rough, he was an apprentice; then in 2007 he was assistant head greenkeeper; now he is the man at the helm. Can you imagine the pressure of years of your work being under the microscope of the world’s finest exponents of the game, never mind television pictures being beamed all around the world to millions of viewers? 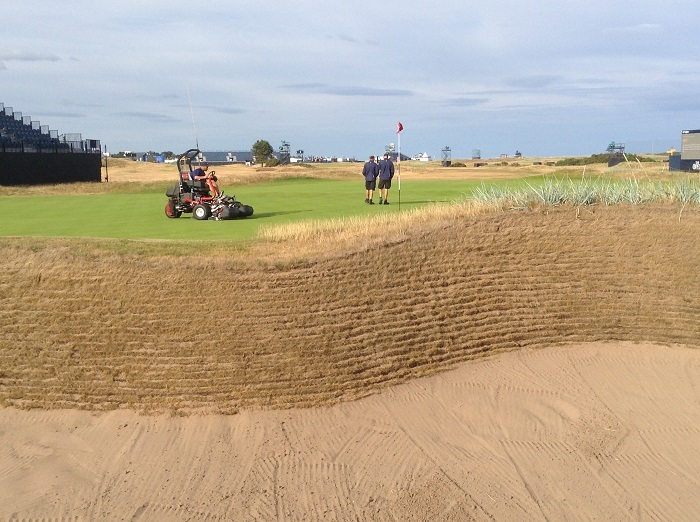 The beautifully revetted bunkers at Carnoustie will test the world’s best. 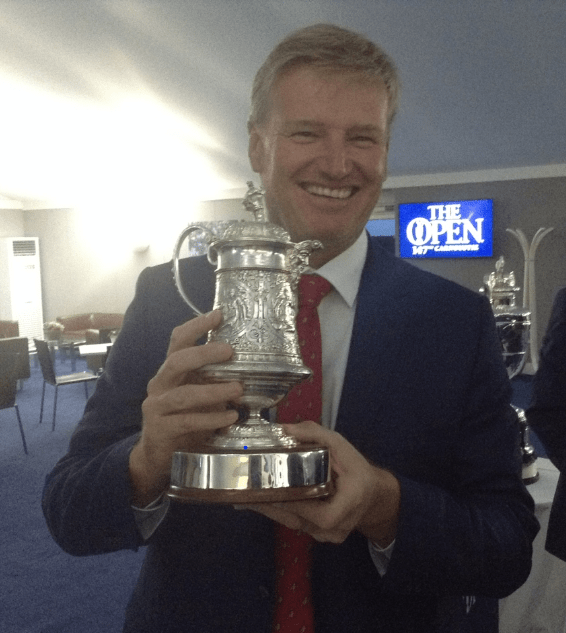 Don’t expect any tricking up of the links – Boath is proud of the fact that Carnoustie can, in his opinion, hold its own with the modern game, technological advances notwithstanding. The course is actually slightly shorter than in 2007 and the fairways are not narrower. In fact, at the 11th hole on the right hand side near the green there is a slight widening out of the fairway. The intention is to have the greens running at between 10 and 10.5 on the stimpmeter, positively slow by Tour standards, but necessary on links courses where off-shore winds will cause the ball to move if the greens are cut any lower. He has presented the course to highlight its strengths. Thoughtful strategy is demanded to avoid the penal bunkers and it’s essential to recognise when to have a go and when to hang back and be a little more conservative. Good shots are rewarded as much as they ever are on a fast-running links and, by and large, this week’s test favours a thoughtful player and a mindless grip-it-and-rip-it-down-there-as-far-as-you-can strategy is going to have to be tempered by sound thinking. Phew – a proper golf course then and not even the teensiest bit tricked up. Thank you, Craig and team. The work is endless when preparing a course for an Open Championship. Tuesday evening at The Open Championship can only mean one thing – the AGW (Association of Golf Writers) dinner, one of my favourite nights of the year. Patricia has been a member of the AGW for donkey’s years and I have ensured that I’ve been permanently on her guest list since I first worked for the BBC at the 1997 Open at Troon. It’s a fun evening with the presentation of a Player of the (previous) Year and various other awards and there are normally a sprinkling of top players present. They’re happy to be there not least because they are free to escape early and their presence is always much appreciated. 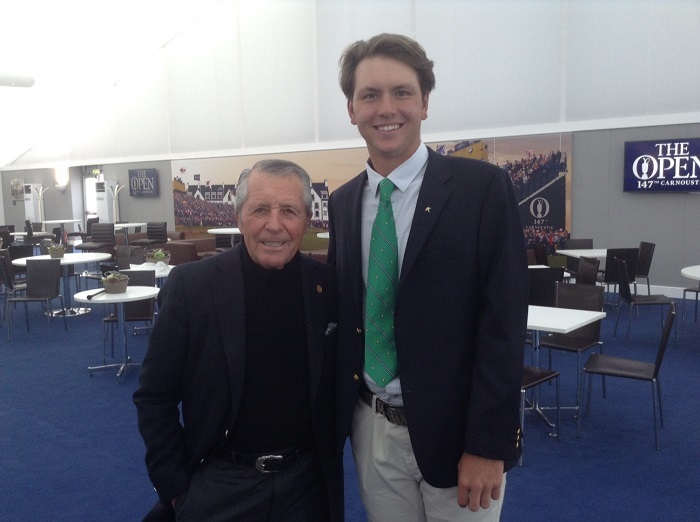 Last year the guest of honour was one of my favourites, Sergio, resplendent in his green Masters jacket. It’s a great opportunity to have an informal chat and take some pics. Alison Root, editor of the informative Women & Golf magazine and a huge Sergio fan, was determined to have her photo taken with the Spanish Masters champ. I obliged and, if I say so myself, took rather a good pic. It was then my turn and Alison took the photo. I hadn’t the heart to tell her later but it was a disaster – she was obviously still shaking with excitement at her proximity to her idol and the resultant blurry image could have been of anyone!! This year the AGW is celebrating its 80th birthday, having been founded by 30 scribes attending the 1938 Walker Cup at St Andrews. Their stated aim was to “establish a close liaison with the governing bodies and promoters of golf” and a list of their past presidents makes for impressive reading with Bernard Darwin, Renton Laidlaw and Percy Huggins amongst their number. As Patricia is back home in Cheshire looking after my husband, who is on the mend post elbow surgery, it fell to me to host her guests at the dinner – a very onerous duty indeed! Ros Rentoul, captain of St Rule Golf Club in St Andrews, and I had played university golf against each other many years ago and hadn’t seen each other since but golf bridges all such divides with ease and I had a lovely evening getting to know her again. 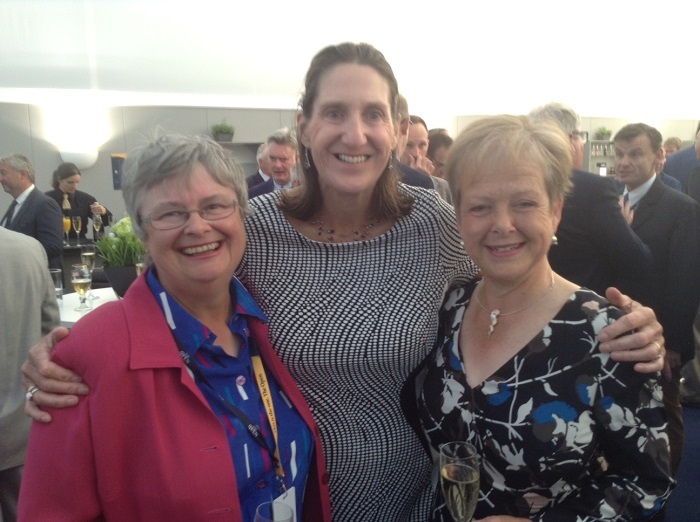 Former Wales international Pam Valentine, now a member of the R&A Amateur Events Committee, fresh from a hole-in-one (her 4th) on ladies’ captain’s day at home in Wrexham, was with us and any evening in her company is a treat. With Pam and Ros. Patricia – we missed you! It was a treat for the three of us to see Segio, Ernie Els and John Paramor, esteemed Rules guru, be presented with their awards and another bonus that Gary Player, although endlessly entertaining, only spoke for three minutes! He spent more time imparting his wisdom to Ernie’s nephew, Jovan Rebula, the newly crowned Amateur champion. Gary draws breath for a photo opportunity with the new Amateur champion. 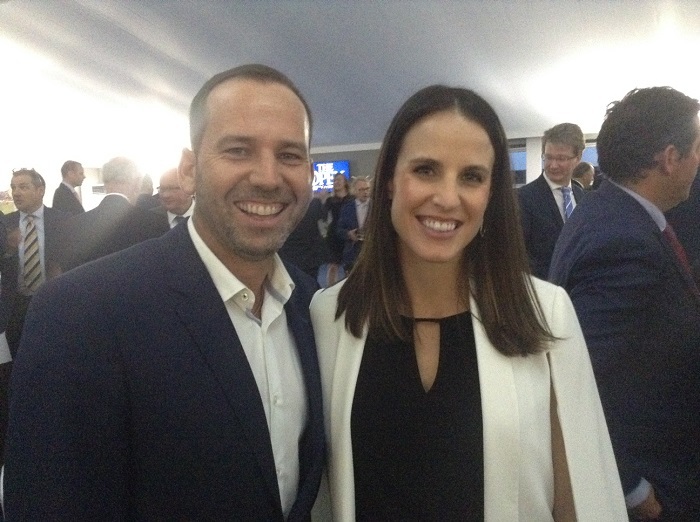 Golf Writers’ Trophy winner Sergio with wife, Angela – not being kept up at night by Azalea they told me! Ernie with the AGW Arnold Palmer Open Award given to the person who has made particular efforts to assist the AGW membership in its endeavours to provide media coverage. As usual, the Master of Ceremonies was the BBC’s excellent Iain Carter who moved the proceedings along with a swing including an entertaining little interview with Jean Van de Velde. When Iain asked Jean did he often hark back to that 72nd hole in 1999 when he”only” needed a double bogey to win the Claret Jug, Jean replied with a wonderful Gallic shrug, “Well, no. Been at the practice days and there is no atmosphere quite like The Open. Loving your commentary on the BBC coverage. Great piece…and thanks for all the very relevant infos on greens staff ! They are so deserving…and need more!Sorry to miss the fun. Enjoy and best to Patricia…hope to see her in Evian. Thanks Susanne, hope all well with you. Patricia. A great insight into what goes on behind the scenes. Agree with Anne too, great commentary on the Beeb! © 2016 Copyright Madill Golf // Imagery by John Minoprio // Website design by jdg.